20th Century Fox has made this sequel a priority, and it’s assumed that the “Untitled Ridley Scott Project” that Fox has set for March 2016 is actually this sequel, which means it’s a good time to start lining all the tar-oozing ducks in a row. Green was brought on to the project after working with Scott on a script for the new Blade Runner movie, which Scott still intends on making at some point, presumably after Prometheus 2 is in the can. Green is currently finishing up a revised edition of the Blade Runner sequel, after which he’ll jump into the wide world of space terror. While Fox declined to comment on the film’s plot, sources for TheWrap say this sequel will be much more comparable to the atmospheric chills of the original Alien. One of the few things I really loved about Prometheus was the constant sense of dread that the film’s progression kept intact, even during scenes involving spacesuit bongs and characters who are unable to effectively run away from giant rolling things. 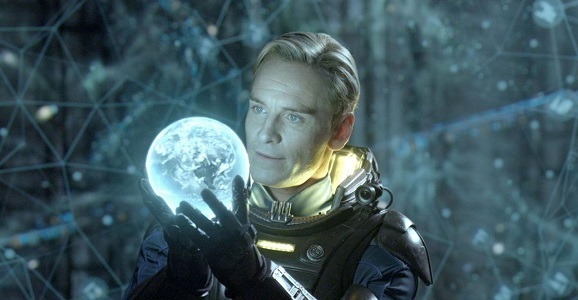 One of the rumored plot points involves multiple version of the David android, which could mean Michael Fassbender will be sharing screentime with himself. That’s fantastic, as his mechanically malicious performance was another one of the first film’s high points. The initial script was written by Transcendence scribe Jack Paglen, and Green will be handling rewriting duties. While Green Lantern is his only produced feature, Green has done quite a bit of work on the small screen, including episodes of Heroes, Kings, and The River. He’s also a member of the screenwriting militia that pounded out a script for DC’s theatrical revival of The Flash. Those hoping to avoid that Blade Runner sequel will take comfort in knowing Prometheus 2 is definitely going to be Scott’s next project as soon as he completely finishes with his upcoming biblical epic Exodus. Assuming Green doesn’t get replaced by a guy who wrote some other disappointing tentpole flick from a few years ago. While we can’t tell you the secrets behind the screenwriter-hiring process, we can share with you the secrets of Prometheus in the video below. Green is the writer who gave us “The River”,(another one of the dozens of “Lost” formula wannabe ‘s}.It tanked big time loosing half it’s audience , 8.4 million viewers to only 4 million in just under 8weeks. I wonder why?